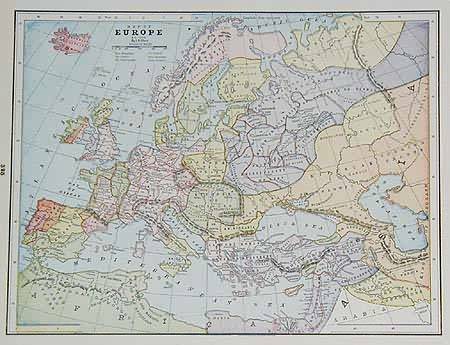 Introduction: The panorama of European life around the year 1200 is so vast and multiform that its description must be highly selective. I fear that some of the things I have to say will be all too well known, while others may appear too narrowly historical or too sweepingly theological. Yet, for a synthetic introduction to an age, certain fundamental historical facts as well as certain generalities concerning the mental structure of the era do seem to be essential. My illustrations have been chose not so much for strictly art historical reasons, as to illuminate historical personages, events, and trends. Though my subject is primarily the life of the mind, I shall for the purpose of preliminary orientation in time and space begin with a brief sketch of some of the principal personalities and events during he years from 1180 to approximately 1230. The death of John of Salisbury, as bishop of Chartres, in 1180 may be considered one of the terminal points of the immediately preceding period, the twelfth-century Renaissance, which owed much to this great humanist and to the School of Chartres. The same year saw the accession to the throne of the one the great rulers of the time, Philip Augustus, king of France until 1223. During the following decade two eminent political figures of the twelfth-century West disappeared: One was Henry II of the Angevin Empire – he was king of England and effective ruler of half of France, partly through his famous wife, Eleanor of Aquitaine; the other was Frederick Barbarossa, the first of three great Hohenstaufen emperors in Germany and Italy – he perished at the beginning of the Third Crusade, which had been set in motion by the Muslim conquest of Jerusalem in 1187. The last years of the century were years of profound charge in the leadership of the Christian world. With the death in 1107 of Emperor Henry VI, heir of Barbarossa and ruler, on behalf of his wife, also of the Norman kingdom of Sicily, and with the election to the papal throne of Innocent III one year later, the hegemonic role of the Holy Roman Empire was eclipsed by the papacy. At the same time, the death of Richard the Lionhearted in 1199 and the succession of his brother, John Lackland, led to the near disintegration of the Angevin Emoire – that is to say, to the loss of Normandy and of other English possessions in France to King Philip Augustus.